Sorry for being MIA yesterday. This week, with the start of school and the continuation of several part time jobs, I have been super super busy. Hopefully my schedule will calm down and my sanity will return once I have gotten back into the swing of things. Until then I will do my best to do a post everyday. Stick with me! Given all that, I am super excited to tell you about my weekend plans. I will be going home to Connecticut to spend the weekend celebrating my parents' birthdays. We decided, way back in March, that a fun way to celebrate would be to take a tour of Philip Johnson's Glass House in New Canaan, Connecticut. You have to book your tour tickets nearly 6 months in advance and I am so glad to see that the weather looks promising now that our day has finally rolled around. 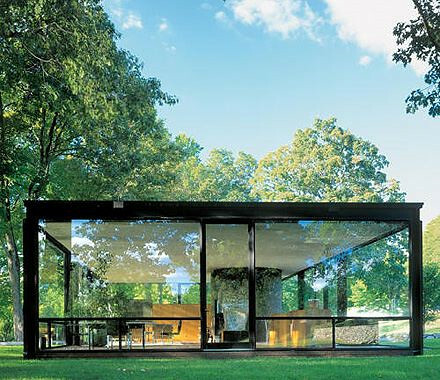 "The Glass House or Johnson house, built in 1949 in New Canaan, Connecticut, was designed by Philip Johnson as his own residence and is a masterpiece in the use of glass. It was an important and influential project for Johnson and his associate Richard Foster, and for modern architecture. The building is an essay in minimal structure, geometry, proportion, and the effects of transparency and reflection. The estate includes other buildings designed by Johnson that span his career. The house builds on ideas of German architects from the 1920s ("Glasarchitektur"). In a house of glass, the views of the landscape are its “wallpaper” ("I have very expensive wallpaper," Johnson once said.) 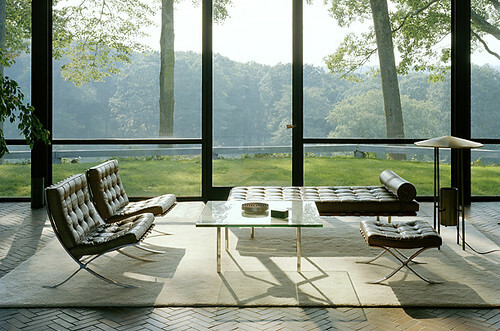 Johnson was also inspired by the design of Mies van der Rohe's Farnsworth House." 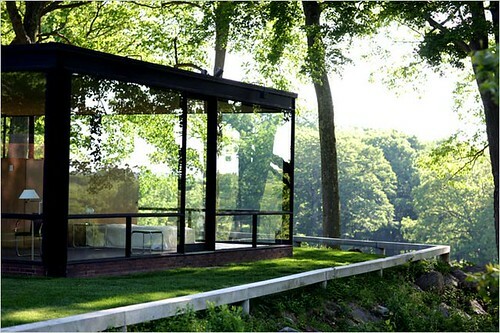 Find out more about the Glass House, Philip Johnson and modern architecture here.